Flour is a main ingredient in most baking recipes and the type of flour chosen can make a huge difference in the final product. It’s also useful to consider flour nuances when making substitutions in vegan and high-altitude baking, so understanding flour will help you be your best baker. All-purpose flour tops the wheat flour charts with 10-12% protein, although this is sometimes not enough to maintain structure in goods baked at high altitude. As explained in a previous post, baking at higher altitudes can result in crumbly textures. Protein is what helps keeps the batter structure together so upping protein in a recipe can be the solution. But then, by veganizing a baked good, you lose the protein provided by the eggs so you now need even more protein. This can be achieved by substituting some of the flour with a higher protein variety (i.e. almond or garbanzo bean flour) or by using tofu as an egg substitute. These fixes helped my baking because I found that packaged egg replacer (made from potato starch) fell flat in my baked beauties. Another important baking aspect is how to measure flour. I’ve read recipes that say to pack the flour into the cup and some that say to lightly pour it in. Joy of Baking mentions what I learned decades ago to be the proper way: “When measuring flour spoon your flour into a measuring cup and then level off the cup with a knife. Do not pack it down. 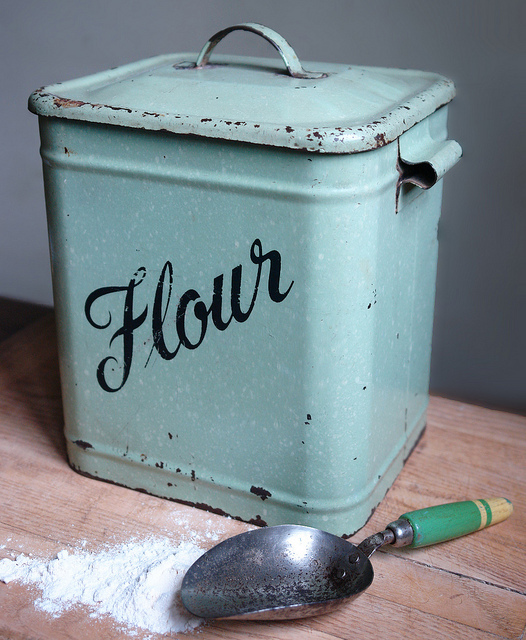 Flour gets compacted in the bag during shipping, so scooping your flour right out of the bag using your measuring cup will result in too much flour.” And too much flour makes for heavy cookies and tough bread. When you follow my recipes, this is the method of measuring that I use so for best results you should do the same. These are just a few ideas on how flour impacts baking. I hope they get you started on making your best looking baked goods. 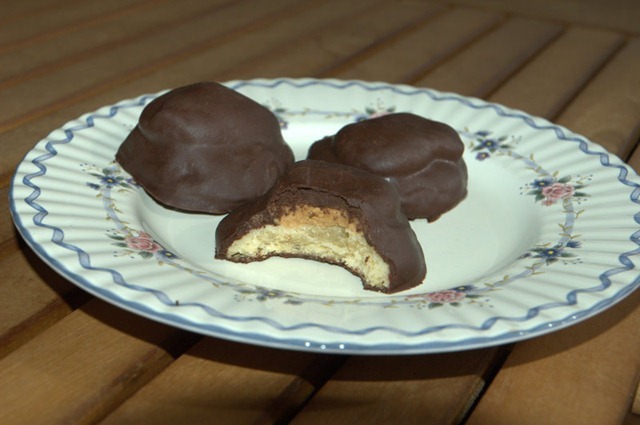 I must confess – I have never had the Girl Scout Cookie “Tagalong.” I was a Thin Mint girl. But, when I saw a blog with Homemade Tagalongs (shortbread with a blot of peanut butter and a chocolate coating), I decided it was time to try them. Of course they needed to be vegan and high altitude. No problem. I have another confession – I never look at how many cookies a recipe is supposed to make. This time I should have. It said to make 3 dozen while I made only 2 dozen of the most rich and decadent things around. Okay, maybe not such a bad thing. Preheat oven to 370F. In a large mixing bowl, cream together margarine and sugar. Mix in flour, baking powder and salt at a low speed, followed by the vanilla and milk. The dough should come together into a soft ball. Take a scoop of dough and flatten it into a disc about 1/4-inch thick. Place on a baking sheet and repeat with remaining dough. Cookies will not spread much, so you can arrange them fairly closely together. Bake cookies for 22-24 minutes, until bottoms and the edges are lightly browned and cookies are set. Start with the sheet on a rack in the lower 1/3 of the oven and move them up to the top rack half-way through baking time. Immediately after removing cookies from the oven, use a small spoon to make a depression in the center of each cookie. Cool for a few minutes on the baking sheet then transfer to a wire rack to cool completely. For Filling: mix together peanut butter, confectioners’ sugar, salt and vanilla in a small bowl. Put in a plastic zip bag and work with your hands until it is soft. Cut a corner off the bag and pipe a dome of the filling into each cookie’s “thumbprint.” Chill filled cookies for 20 minutes, or until the peanut butter is firm. Melt the chocolate and oil in a small, heat-resistant bowl placed over a small saucepan filled with simmering (not boiling) water. 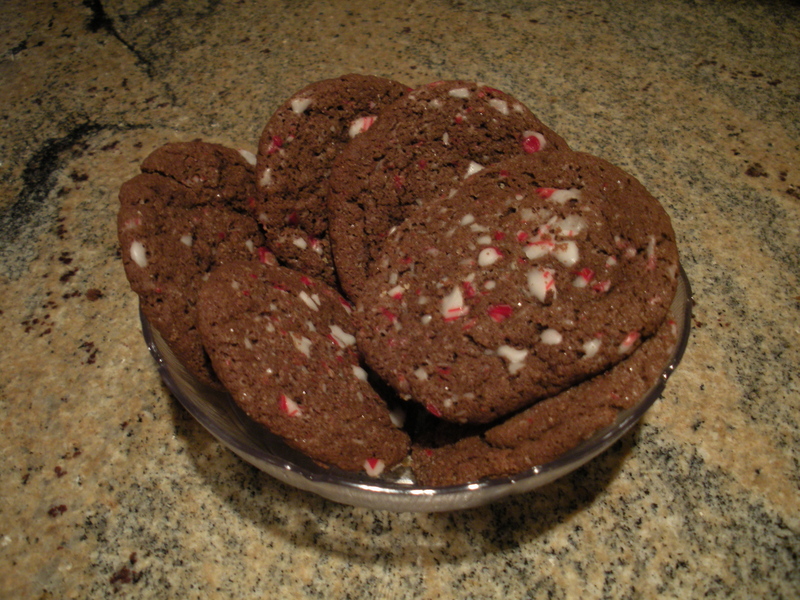 Dip chilled cookies into chocolate, let excess drip off, and place on a sheet of parchment paper to set. How do you swap out eggs to veganize a non-vegan recipe? There are dozens of egg substitutions for a vegan baker, but it wasn’t until I moved to high altitude that I discovered that they each have different results. Baking science at altitude is tricky, so the properties of each substitute should be examined to find the right one for your baking project. 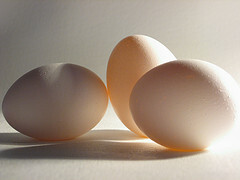 Eggs are used in baking for several functions – binding, leavening, and adding moisture. Adding eggs for proper binding ensures that your treat doesn’t fall apart after it’s baked. A leavening agent makes things rise during baking, and when the proteins in egg whites are heated they explode and make the baked good light and fluffy. The yolk of the egg adds richness and moisture when used in baking. In a previous post, I discussed how baking at altitude causes problems such as coarse texture or a fallen cake due to excess rising. The decreased air pressure causes a quicker rise and then a subsequent fall from a weakened protein structure. With an already weaker structure, it’s almost inevitable that the removal of the protein-filled egg will wreak even more havoc. Thus, I decided that my egg substitutes should not be starch based, like commercial egg replacers. I needed extra protein in my baked goods. I also found out that bananas hold air bubbles well, which makes a baked item airy and moist. 1/4 cup mashed bananas can sub for 1 egg when used to leaven or add moisture. When choosing a substitute don’t forget to take into consideration that some substitutions will alter the flavor of your baked treat. I have dabbled with the idea that higher-protein flours (such as soy or garbanzo) might offer high altitude help but they, too, will affect the flavor profile. Experiment ideas for another day. Now that you know the whys of high altitude egg substitution, you can figure out the what for your next recipe. Posting on Mother’s Day meant I had to do something special, something a bit fancy. 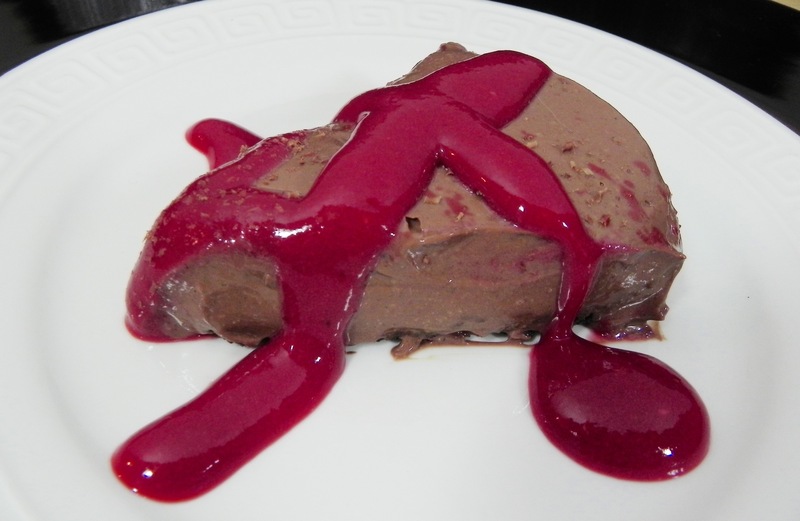 Chocolate mousse came to mind but this is a baking blog and mousse isn’t baked. So, I decided to bake a chocolate cookie crust as a vehicle for my tasty chocolate mousse. Besides a crunchy pie crust, I added a bit of glamour by making a raspberry drizzle (also known as “coulis”). The sauce adds bright color and flavor, is amazingly easy, and the leftovers are great on waffles. It rounds out this simple and fun dessert. For Chocolate Cookie Crust: Preheat oven to 350F. Lightly oil a 9″ pie plate. In a medium-sized bowl, mix together the cookie crumbs and melted butter until well blended. Press evenly into the bottom of the pie plate and slightly up the sides. Bake for 10 minutes. When done, cool on a wire rack. For Chocolate Mousse: Melt the chocolate chips in a double boiler by placing the chips in a small saucepan. Set this pan in a larger pot filled with 1/4 to 1/2 cup of water. Heat over medium heat on the stove and stir the chips until they are melted. Place the milk, extract and tofu into a blender. Process until almost fully smooth. Scrape down the sides and add the melted chocolate. Process until completely smooth. For Raspberry Sauce: In a blender, thoroughly blend the raspberries and sugar. Strain through a fine-mesh strainer to remove seeds. Store in an airtight container in the refrigerator for up to one week. To Assemble the Pie: Pour the mousse into the fully-cooled pie crust. Chill in the refrigerator for at least one hour. To serve, garnish with a drizzle of raspberry sauce. You can also add fresh fruit, chocolate shavings and whipped cream. Happy Mother’s Day, and happy baking! During National Vegan Cookie Month, I baked a lot of cookies. I experimented with different ways of preparation and baking, and I discovered something amazing – Cookie Scoops do make a difference. While making a batch of cookies, I had only enough dough at the end to make a few so I rolled them by hand instead of scooping them. They were baked the same amount of time as the others but they turned out drastically different. They spread more making them crunchier and, frankly, they were uglier. I should reveal that I have used scoops only occasionally in the past; they just seem too fussy. And I never drop cookies from spoons because of the awkwardness. Generally I roll the cookies into balls with my hands and flatten them slightly once on the cookie sheet. I didn’t realize that there is an art form and a science to using cookie scoops until I did some research. The baker also notes that using a cookie scoop saved time and kept the baker’s hands clean. Plus, scoops come in various sizes so you can choose from bite-sized to huge. This gave me insight into the benefits of using a scoop, but I didn’t get an explanation on why my cookies spread until I delved deeper. I moved on to an article discussing cookie spread. “(Why) does baking temperature affect cookie spread? Because the fat in cookies is a big part of their structure, prior to baking. Scoop the dough onto the baking sheet, and the fat is at least partially responsible for them holding their shape.” I thought about oven temps and realized that the temperature of my hands became a factor in how they baked. My hand heat must have started to melt the fat and caused them to lose shape before they even hit the oven. So, what did I learn? That cookies are finicky!! For a perfect looking cookie, baby the dough by using a cookie scoop instead of your hands.